Build Cognitive Flexibility with Physical Activity! Today’s tip to help with your holiday shopping and cognitive flexibility is – keep active! Physical activity helps to get blood flow to the brain. 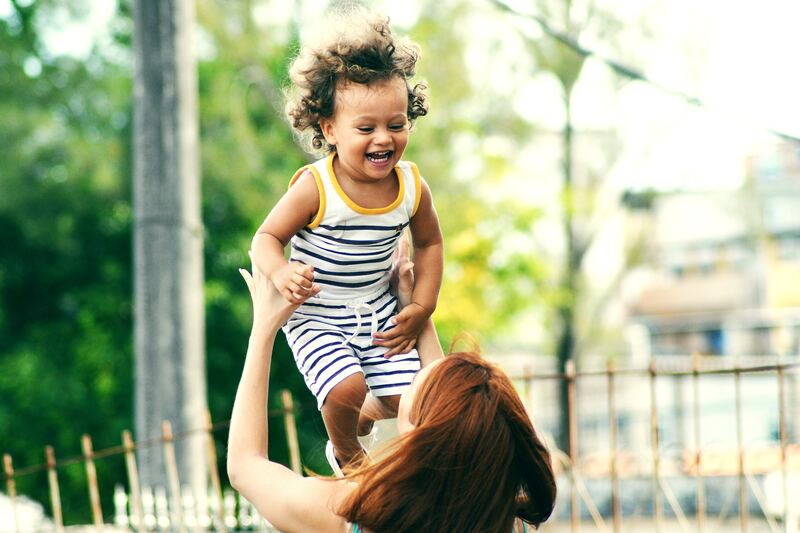 Dr. Jen loves the benefits a mini-rebounder has brought to her family’s active lifestyle. Watch it below, or check out all our tips on Facebook. Today’s fun tip for building cognitive flexibility over the holidays is: buy a good joke book! Our tip today, in preparation for your holiday gift purchases, is to buy some games that build flexibility into kid’s brains! 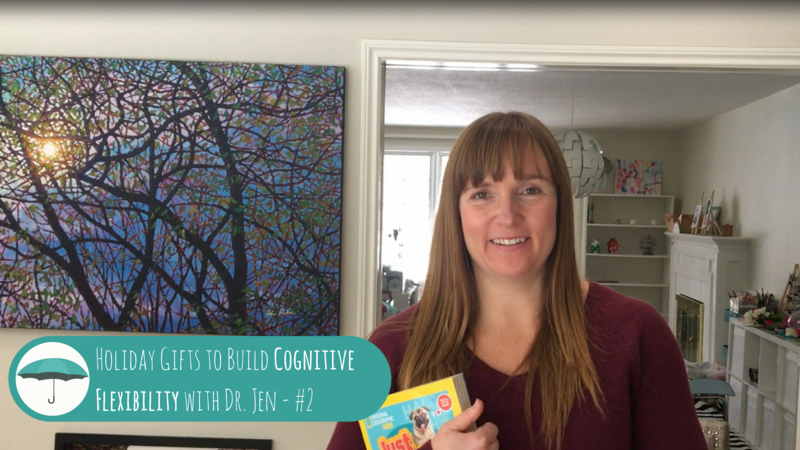 Watch the video below to find out why Dr. Jen loves the game, Apples to Apples. You can also watch the video directly on our Facebook page! 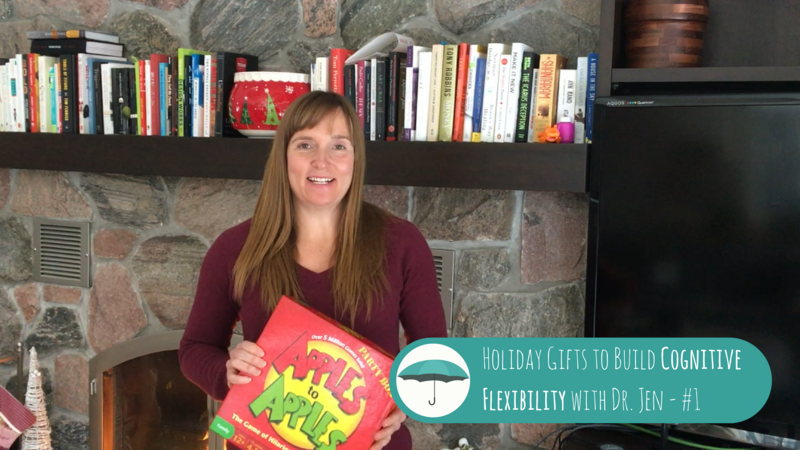 Here’s the best thing you can do this holiday season to help your kids with their brain flexibility – I promise, it’s fun! This holiday season I have one piece of well-researched advice that I think you’re going to like: Have as much fun as possible. Being in a positive mood increases our open mindedness and therefore our cognitive flexibility. A positive mood helps us broaden our sense of what’s possible and try new things. This allows us to build new skills that will be helpful in other parts of our lives long after the positive mood has passed. It’s a real phenomenon in psychology called the “broaden and build” theory. Have you ever tried to convince a child to try a new food or activity when they are in a bad mood? I’m sure you can see how this one works! The more times you are in a positive mood, the more you will try, the more new skills you will build, and the better equipped you will be for the future. Keep this principle in mind while finishing (or starting) your holiday shopping. 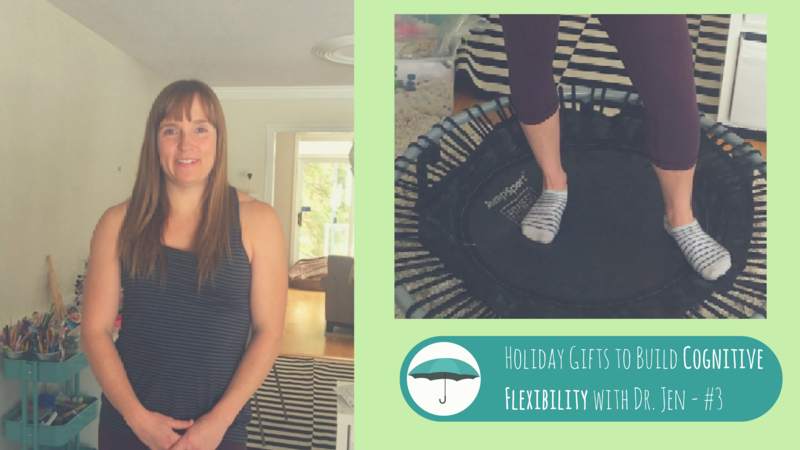 All this week I will be sharing dual purpose holiday gifts that will build brain flexibility for your child while improving positive feelings. A double win for cognitive flexibility!!! Does your child struggle when the rules of life aren’t followed; when things don’t go as expected? Do they spend a lot of time reminding others to follow the rules? 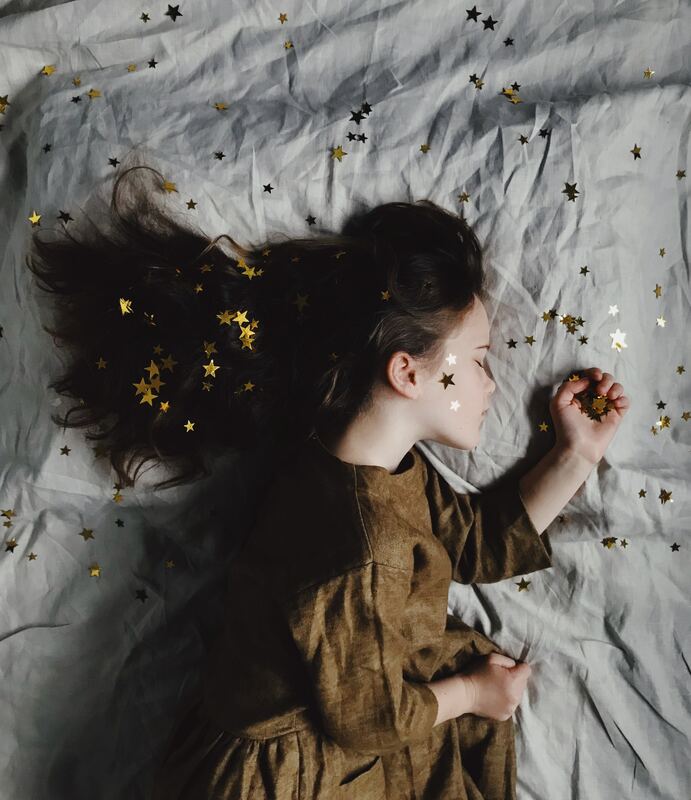 Kids who are too set on a rigid set of rules may be struggling with their cognitive flexibility. Why is this a problem? Adaptability is a big part of wellbeing and sometimes this means a new and unfamiliar set of rules. Not to worry! All strong skills come from practice, and cognitive flexibility is no different. The next time you play a favourite game with your child, try making small changes to the rules. Get creative and show your child that there are many ways to play the same game. This will help them get along with others and boost their problem-solving skills. 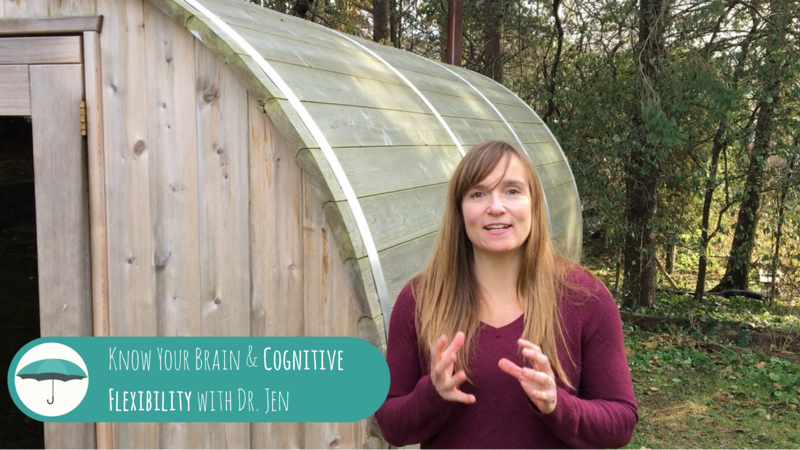 Today’s tip for cognitive flexibility is to know your brain! And help your child get to know theirs. Each of us is very different, and what might prime one person’s brain for learning might not work for their friends or family. So get out there – experiment and try out different things before your next big day.